When a serious dispute arises, the common response is to instruct lawyers immediately and to take the battle straightaway into the Courtroom. This may be the preference of many who have no faith that the dispute can be resolved. In recent times however, disputants are awakening to another option that is less costly and oftentimes speedier than litigation. Mediation is fast gaining traction as an alternative to Court litigation with a credible rate of success. And indeed, when parties are prepared to take a less battle-like stance, mediation is an excellent pathway to peace. How then do parties increase their chances of finding success in mediation? We suggest that the starting point is to apply some effort in your search for a suitable mediator for your case. It is imperative for the negotiation process to be facilitated by one who does not take any one party’s side. A good mediator has no desire to take sides. He/she will restrain himself/herself from making judgment against one party or to prefer one party to another. Why is this so? Because it is untenable for a mediator to confuse the disputants that he/she has any adjudication function. 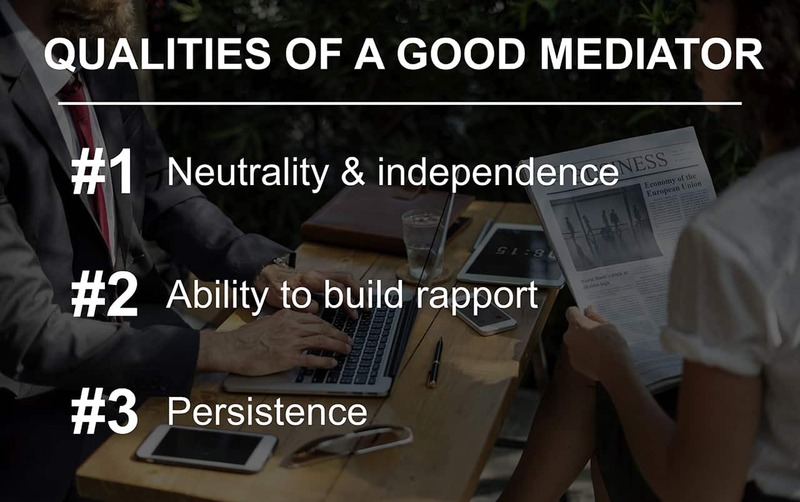 A good mediator knows that if there is no neutrality in the mediation process, it is impossible for the parties to find the safe space within which to speak frankly and to explore settlement options. Being personable is a quality that is often underrated. Being in the close company of disputing parties is often an unpleasant experience. No one looks forward to meeting his nemesis. Having a personable mediator facilitate the negotiations can alleviate the discomfort in this process to a large degree. Having excellent listening, understanding and communication skills are also key requirements. Why are these skills and qualities important? Because all these go towards the building of rapport between the mediator and the disputants. It is after all part and parcel of the Mediator’s role to diffuse tension, to create the conducive environment for disputants, so that they are sufficiently relaxed and be in the mood to work out their differences. It is not uncommon that by the time the disputants arrive at mediation, they may have had prior stabs at negotiating a settlement amongst themselves. The mediation process can be more challenging in such cases. A difference can be made through the appointment of a mediator who has a quality of being generous with time and effort. Someone who is just plain persistent. Such temperament in the mediator is called upon so as to keep parties being engaged in continual conversation. This is especially important when negotiation fatigue starts to set in. Being generous with time and effort, the ability to drive parties to keep the conversation going in the face of impasse, can make all the difference. Again, the aim is really to give the disputants the sufficient space and time to work out their differences. It has been suggested that a mediator is, at heart, a cheerleader. There is some truth in this. A good mediator knows that he needs to be a source of encouragement to keep the disputants working together to find a solution. A good starting point in your search for a candidate is to spend some time reflecting on your dispute. Start by crafting a brief outline of how the dispute arose and where parties are at present, whether at the cusp of commencing litigation or perhaps after exchanging settlement proposals. Keep the outline broad and succinct. Leave out the names of parties, or keep other sensitive materials or information confidential, if you are uncomfortable to disclose more at this infant stage of your search. There is no need for such details in this outline. Once such a brief outline is prepared, you are in the position to reach out to mediation institutions. Or you may want to send queries to mediation groups, these being groupings of mediators who market their services under an umbrella brand. There are also private individuals (private mediators) who cultivate a business in mediation without association to any mediation institutions. You may want to consider them instead. Check whether the mediator is accredited – For a candidate who is accredited, you may want to find out more about the criteria and standards for accreditation of the institution from which he/she is accredited. 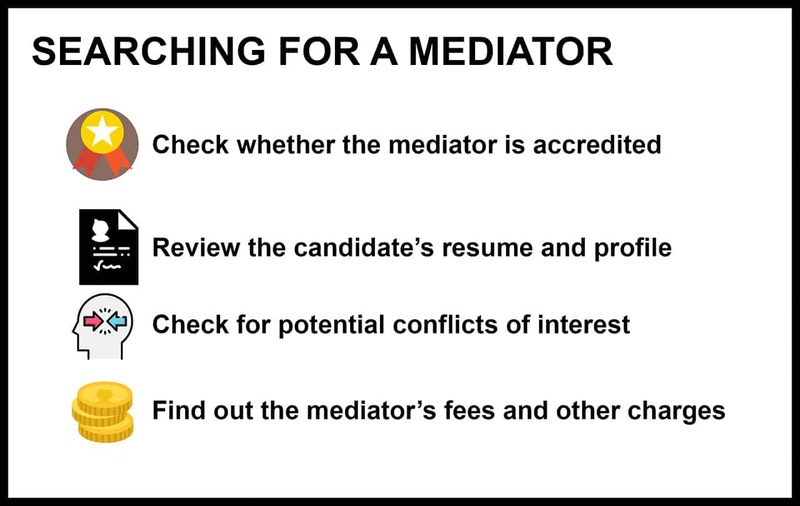 Institutions may require their mediators to undergo accreditation tests, yearly review of the record of cases, or other tangible measures of the mediator’s commitment to the craft. In Singapore, the Singapore Mediation Centre is gaining recognition for the mediation services it provides. If the candidate is a private mediator who has not nor has ever been accredited by any mediation institution, you may wish to inquire about the mediation training courses that he/she has completed. Know your candidate – Ask to review the professional profile or resume of the candidate. Such profiles would typically include background information on the candidate, such as the candidate’s vocation, other professional qualifications, or even some personal information. Knowing the professional qualification may be useful if for instance yours is a Building and Construction dispute, and you prefer a mediator who is familiar with the technical terms in this field. You may be curious about the candidate’s track record of success in mediation. The resume may or may not reveal the cases that he/she has mediated. Do not be disappointed if the resume holds little detail on the historical track record of success. Mediations are conducted in confidence, so mediators are generally discreet about his/her work even if there have been stellar successes in the past. Check for conflict or potential conflict of interest – If you had kept the names of the disputants confidential at the first stage of your search, it is imperative in this selection phase to reveal the names and have the candidate conduct a conflict of interest search. You, as well as the candidate, need to be thoroughly satisfied that the candidate has not had any prior dealing on the same subject matter or relationship with any of the parties concerned that would amount to a conflict of interest. Find out the mediator’s fees and other charges – There are mediators who are happy to act for modest fees. The venue charges may be negligible if the mediation is conducted in the mediator’s private office. At the other end of the spectrum, experienced mediators who have gained repute tend to command significantly higher fees. As for mediations appointed through the auspices of mediation institutions such as the Singapore Mediation Centre, the charges will include filing and administrative fees and cost of the venue. You may want to visit the website of the Singapore Mediation Centre to understand more. Question #1: Is it part of the mediator’s role to help parties evaluate their dispute? Unless otherwise specified, the mediator will not enter into the realm of evaluating the parties’ dispute. However, if parties so desire for the mediator to provide a neutral evaluation, this ought to be specified at the outset prior to engagement. Parties themselves should agree to the issues in dispute to be referred for neutral evaluation. And the mediator needs to be aware and agree to do so at the time of his/her appointment. Question #2: In what situations would appointing two mediators be useful instead of a single mediator? For highly complex disputes that demand technical knowledge or know-how from multiple disciplines, the parties may consider it useful to engage the assistance of two mediators. It is not an uncommon practice for two persons to co-mediate so as to better guide the disputants in areas that either is familiar with or have prior experience in. Question #3: Are there any advantages in appointing a mediator who is legally trained or perhaps had served as a judge before? As the mediator’s role is not that of a legal adviser, there ought not to be any advantage in appointing a mediator who is legally trained, be it a lawyer or retired judge. This is particularly so when the disputants are accompanied by their lawyers in the mediation session. Having said this, however, it is not uncommon for parties to gravitate towards mediators emanating from the legal profession. Much depends on the comfort level of the disputants and their perception of the intangible qualities the particular mediator can bring into the negotiation discussion. If you have any questions about mediation, you can get a Quick Consult with Adeline for a transparent, flat fee of S$49. You can expect a call back within 1-2 days on the phone to get legal advice and have your questions answered. This article is written by Adeline Chong from Legal Ink Law Corporation and edited by Danon Gabriel The of Asia Law Network. Adeline graduated from the National University of Singapore in 1994 and was admitted to the Singapore Bar in 1995. She has been in private practice ever since. With more than two decades of litigation experience, she has represented a variety of clients on a wide range of issues and disputes. Adeline's main areas of expertise include negligence claims, contract, family and employment disputes. Adeline is an Associate Mediator of the Singapore Mediation Centre since 2015. I agree that it is important to know your possible mediator. This would help determine if you’ll work well together. Thanks for your advice! Hopefully, I won’t need this knowledge.